I like GlaxoSmithKline (GSK) much more than the stock’s fifteen-year track record of earnings and stock price changes would suggest that I should. 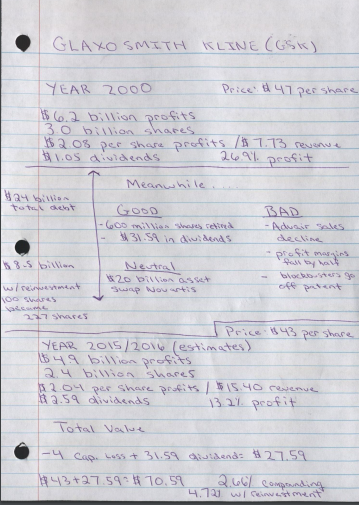 I scanned a page of my overview notes for GlaxoSmithKline and attached a page to the bottom of this post. The quick metrics for GlaxoSmithKline aren’t pretty. From 2000 through the first quarter of 2016, the price of the stock has declined from $47 to $43 per share. That negligible change in share price makes sense, because the profits per share generated by a GlaxoSmithKline investment generally remained stagnant. Glaxo earned $2.08 per share in profits back in 2000, and it earns an estimated $2.04 per share now. The reason why GlaxoSmithKline is because some of its profit generators haven’t held up well in the face of competition. To give an example, look at the asthma medicine Advair. It rose in sales to $9 billion, and earned profits in the $300 million to $450 million range every quarter. Now it’s facing generic competition, and sales of Advair have come down to the $5 billion range. The price has come down to reflect the competition, and now the contribution to the bottom line is in the $150 million range. This mandated that the rest of the Glaxo portfolio needed to collectively grow profits by at least $300 million to remain even with the status quo that Advair once created. This is the process that repeated itself for the past decade and a half–a pharmaceutical drug or vaccine would experience ebbs and flows in sales, and the growth of the Glaxo’s consumer division was never quite enough to advance earnings in a sustainable way. That’s why you have seen Glaxo’s earnings rise as high as $3.38 and fall as low as $0.52 at different times in the past fifteen years. Last year, Glaxo got sick of this ebb-and-flow earnings seesaw and engaged in a $20 billion swap with Novartis in which it gave away its promising but speculative cancer treatment products and received the stodgy but reliable vaccine division at Novartis. This move removed the remote but slightly reasonably possibility of long-term double digit earnings growth in the event that a cancer treatment proved quite effective, but it greatly increased the possibility of GlaxoSmithKline becoming a corporation that delivers 5-6% earnings growth over the full course of the business cycle (and delivering those earnings in a more consistent fashion). It’s not a free lunch–even trade magazine experts are having trouble giving a high probability opinion as to whether GlaxoSmithKline or Novartis got the better end of the bargain–but it does seem to be a rational move for GlaxoSmithKline in light of its 15+ year frustration in trying to grow the firm’s earnings power. If Novartis gets a big break, people will chide GlaxoSmithKline for being impatient and acting out of desperation to secure a steady revenue stream. If Novartis doesn’t get a big payoff, people will congratulate GlaxoSmithKline management for adjusting the business model for the 21st century or whatever. But in my view, there’s no clear winner at the time of the deal. Now, for most of its history, GlaxoSmithKline rewarded shareholders very, very well. You’ve gotten 11% annual returns since the 1986 merger, and the special benefit is that a slight majority of those returns came from the receipt of cash dividends. Even if you spent every single dividend along the way, a $10,000 investment in GSK back in 1986 would have a nominal value of $181,000 and be paying you out $10,860 per year in cash dividends. That’s just about the best case scenario you can hope to find an investment–you get paid a lot of cash along the way, and your net worth in the stock still managed to appreciate by a respectable amount considering that the corporation was a cash cow providing you dividends to spend however you’d like every three months. But, as is often the case, the sequence of returns did not come in a linear fashion. Glaxo shares compounded at a rate of 20.2% annually from 1986 through 1999, and have since compounded at a rate of 2.66% annually. The past 15+ years have been a period of no wealth creation, as the compounding rate was so low that it almost but not quite kept you even with inflation. If a GlaxoSmithKline could provide you with 1,000 metaphorical hamburgers back in 2000, it would only give you the purchasing power for 950 today. Even amidst this period of 2.66% compounding, I can find room for an optimistic view. Because of its high cash payout, the shares of GlaxoSmithKline have been a compounding machine these past fifteen years. Collecting 5% or 6% dividends over and over again for fifteen years amidst share price stagnation does improve the story. The 2.66% compounding figure assumes that you collected your GlaxoSmithKline payout and then let it sit as cash. Well, in reality, you probably did better than that. If you owned 1,000 shares in 2000, you probably didn’t spend the past 15+ years letting $31,590 build up in a brokerage account undisturbed. You probably put it to work somehow, and this would have improved your compounding rate. If you put those dividends to work by clicking the reinvest button on your brokerage account and adding new shares of Glaxo (GSK) every three months, the share count has risen rapidly. Each share of GSK in 2000 is now 2.27 shares of GSK with dividends reinvested. Owned 100 shares of Glaxo in 2000 and decide to reinvest? You got 227 shares now. If you had 1,000 shares of GSK like the previous hypothetical, you’re up to 2,270 shares today. You get the idea. And here is the important part of reinvesting which is sometimes overlooked: When you choose to reinvest, you paradoxically become more reliant on the share price of the company into which you reinvest (I use the word paradoxically because people that practice income investing often do so with the intention of distancing themselves from the gyrations in the stock market, but when you reinvest, the value of those dividends then becomes subsequently tied to the price of the stock into which you reinvest). The downside of this strategy is most apparent when the stock price declines over a long investment period. Because the price of GlaxoSmithKline declined from $47 to $43 per share from 2000 through today, each dividend is now worth less than had you received it as cash. That is to say, you chose to be patient, and then your cash value has taken a hit of 8.5% due to declines in the market price. Cumulatively, this has been offset a bit by the effects of a rising share count that makes future payments higher than would be the case if the cash piled up as stagnant capital. Why do I mention all of this? Because a quick uptick in the price of the stock will have an exaggerated effect on how we view the long-term reinvestor in GlaxoSmithKline stock. If you purchased 100 shares in 2000 at $47, the comparison is to 227 shares worth $43, or $9,761. But if, say, the price of Glaxo were to rise to $60, the comparison would be to 227 shares worth $60, or $13,620. All of a sudden, that decade and a half of stagnation turned into 7.35% annual compounding. It’s important to note how a quick change in sentiment, or a couple earnings beat, can radically transform the fate of someone who piles up shares through a reinvestment program. My view on GlaxoSmithKline is that it will perform like the healthcare sector’s version of a utility, and that is not an insult. The Novartis swap greatly enhanced the predictability of Glaxo’s future earnings growth as it transitions from “heavy” to “moderate” reliance on its pharmaceutical division and simultaneously transitions from “low” to “moderate” reliance on the stodgy consumer side. This ought to deliver long-term earnings growth in the neighborhood of 5-6%. When you are simultaneously collecting 5% or so in annual dividends, that type of growth is more than satisfactory. A lot of people have grown disheartened as long-term income investors in GlaxoSmithKline. But great businesses go through extended periods of not creating wealth. Johnson & Johnson didn’t create wealth during the 2000s, Hershey stagnated from 2004 through 2009, and heck, Coca-Cola shareholders lost 30% of their value from 1972 through 1981 (before compounding at 27% annually during the 1980s). GlaxoSmithKline isn’t nearly as excellent of a business as those I just mentioned, but it’s darn good. It’s probably somewhere between the 35th and 70th best business in the world, depending on whether you favor earnings quality or likely growth profile in your analysis of what makes businesses superior. First, when you see Glaxo’s 2.66% compounding since 2000, keep in mind that calculators are programmed to tally up total dividend payments and adjust for share price change. This is the correct way to calculate investment performance, but it often will understate the actual reality because you won’t let dividends pile up for 15 years. If you reinvested, you would have gotten 4.72% annual returns. And if the price recovers, using $60 as an example, suddenly those reinvested shares take on very high importance and your overall performance with dividends reinvested will rise significantly. Secondly, as a factual matter, the stagnation of GlaxoSmithKline these past fifteen years is different than the stagnation at a peer like Johnson & Johnson. In the case of Johnson & Johnson, earnings were actually growing. At GSK, you got stagnation. A languishing price is fine if the profits are growing because it will eventually be remedied provided you didn’t overpay at the outset. With GlaxoSmithKline, the languishing is the result of the business itself languishing. Thirdly, my prediction is that Glaxo will grow earnings in the 5-6% range over the long haul. At $43, that’s not a bad price to pay for a large dividend that ought to grow by low single digits over the long haul (but the dividend payments fluctuate with earnings, so you should view at as “collecting wads of cash” rather than an income stream that rises with precision. My prediction is that investors of today will earn returns that match or nearly match the S&P 500 while providing a large chunk of the returns as dividend income. And for the people that have been reinvesting since 2000? They will eventually reach a point where even those shares compound at a 6-7% rate. And lastly, in general, you should recognize the importance of patience. In bull markets, people give it lip service. But even with the best businesses, I can find decade-long stretches where investors didn’t really get their due. People grow impatient and sell their stakes, and then the next investor comes along and earns outsized returns because they get to capture both subsequent business performance and valuation improvement to reflect what should have been accretive to you.